A fitting follow up to this morning’s keynote about understanding user motivations, Greg Jarboe, co-founder of SEO-PR, will be sharing a brand new case study with us, aimed at connecting the dots between search and social. Figuring out how everything glues together seems to be the new mission impossible, Greg says. Clay Shirky set the stage by opening up the possibility that the solution may not be technology. Who knew? Greg is a generous search and social expert who has been featured before on the BCI blog, including earlier this year when he answered some of my questions on emerging media opportunities, video search, news search, public relations and link building. And here I am, once again looking forward to the golden nuggets Greg is about to share. Read on and partake in the treasure! With the moderator MIA, Greg starts up the session by asking who in the audience is working for a non-profit, who’s in a large organization, mid-sized and small. Mid-sized and small make up the majority. Greg says that there was some concern that this would b e a recycled case study. The reason he uses case studies is that he believes people learn more from stories than statistics. Of course, there will be statistics involved, but the story helps us remember things and retell them. And it turns out this is a new story. It began on July 1, Greg blogged about it on July 2, and as he was putting this presentation together, he didn’t even know how the story would end. This conference, Greg says, is incredibly complex. It will be hard to digest it all at the end of the week. But if you have to net it out, here’s the lesson. A lot of us think we’re in the search industry. And we are. This other thing has come around called social media. Being who we are we thought, “ooo, links!” But that only worked briefly and then stopped working. If your only motivation is getting to rank higher, it will be short lived. The other side of social becomes clear when you learn how search and social work together. You begin to learn it’s not about the technology. We need to focus on something more fundamental than the technology du jour. Focus on the people using the technology. They behave in ways that you can understand. Here’s the story. It all started in a neighborhood of Boston with a guy named Bruce Marks. About 20 years ago Bruce saw that people in his neighborhood couldn’t get loans. He testified to Congress about the dangers of predatory lending, but no one really listened. Last year something big happened. Bruce and his organization, NACA, had worked out a deal with banks that if someone is having trouble with banks, they would restructure people’s mortgage on the spot — for free. How’d they get this to happen? They had protesters outside of the bank officials’ homes! 125,000 people attended NACA’s first three Save the Dream events. When he first came to Greg before the events had happened, Bruce said he wasn’t sure if the NACA audience was on the Internet. He thought they weren’t the people that search engine marketers normally go after. Greg said that’s okay, he’d try anyway and he’d do it at a loss. He did that because a couple years ago his company worked for Countrywide and got them leads. Greg took the money the company had put in the bank from that deal and reinvested it. Although, Greg did get some delicious lasagna out of it! Now the tour has been to 10 cities and attendance has had a five-fold increase. Considering that the organization thought these people weren’t connected, that’s pretty impressive. So how’d they do it? They used a two-step model that links news search and social marketing. It’s still just a theory, but here’s how it goes. There’s someone that’s an opinion leader who seeks out information and shares it with others. Lots of people search for it, but not everyone shares it. The sharing often happens in a medium outside of search because search is not a sharing medium. The connector here is not technological. There’s no connection between Twitter and Google, for instance. The secret formula for connecting search and social involves people. Follow these steps. First, optimize a press release which includes an embedded YouTube video and photo. This will let the information be found for related terms. PR Web gives data back about headline impressions and full page reads. But ask yourself what’s an impression worth? And what happens after someone reads it? Among those that read the press release, sometimes a journalist is among the group. A journalist wrote the story up in the Cleveland Plain Dealer and it was shared with 1.3 million unique visitors. The journalist model is one marketers are familiar with. When the release was redone for Chicago, it was covered by the Chicago Tribune. It happened again in St Louis with the Post-Dispatch. So what about the video that was embedded? The video talked about how saving a house had saved marriages. It talked about veterans that had given up until the help showed up. And YouTube metrics showed that there were five times the number of views in the first month than average videos. It also showed that a small subset of viewers worked at a TV station in Cleveland. They embedded part of the video in their news story online. A similar thing happened in Chicago and St. Louis. It wasn’t a question of a lot of people saw the video. It was the right people had seen the video and made the decision to share it. Another part of the secret sauce was that the press release included mention of a politician that was helping the organization. Her campaign championed the events, wrote a letter to the editor of her regional newspaper. She uploaded a video to her YouTube channel. She decided to take on the role of opinion leader, taking the information and turning it into influence. This also happened in Chicago and St. Louis as well. People stepped forward to play an unusual role in not only rebroadcasting but getting involved. There were 483 online mentions of the event from July to now. The numbers can be quantified, but at the end of the day, the interesting metric is that you can also start correlating who carried the story and how big their audience was with how many people pre-registered. On Twitter there were 234 tweets, and those who tweeted had 690,000 followers. And this unlocks the puzzle. People weren’t just chatting about it. They were putting their reputation and influence on the line. In the end there were more people walking into the event than people who visited the Web site. Talk about an awesome conversion rate! The people who went to the event would tell their neighbors and friends, an obvious word of mouth component. When this case study is completed, they’ll get to see what happens in Atlanta, one place where there was no main opinion leader through a community leader. Because of that they’re recommending that NACA, if they don’t find a local opinion leader, they should prioritize locations by where they can find the opinion leader. Because that’s the critical glue. 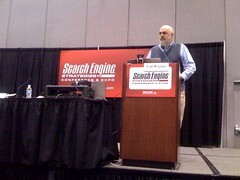 This is the first of several sessions in the Search and Community track. These sessions are compelling stories. You can translate this into activities you’re going to do. But if all you’re going to do with it is sell your product, then search is the way to go. But if you have a larger cause, people will adopt the cause and champion it and become a more powerful sales force than anyone you can hire. But first you need to make the transition. Greg has written a book called YouTube and Video Marketing: An Hour a Day. In it you’ll find many stories on how video marketing worked. One of those is about Barack Obama and the supporters that backed the campaign through video sharing. Obama supporters were found to be more likely than McCain supporters to share videos. What motivated that behavior? We all have a chance to tap into that. There’s a model and it’s a little different. It’s not just the transfer of information. It’s a transfer of influence.